The design of the New Palau Blaugrana enhances FC Barcelona’s global brand and elevates the fan experience while connecting to existing and planned development in the Espai Barça district. The New Palau Blaugrana, which will have a capacity of 12,000 for sporting events and 12,500 for social and cultural events, is a key component of a broader project to improve FC Barcelona’s facilities and create the Espai Barça sports district. The arena for FC Barcelona Lassa, a Euroleague team, will replace the existing 7,500-seat Palau Blaugrana, which opened in 1971. When the New Palau Blaugrana is complete, in time for the 2019-2020 season, it will be a highly immersive destination integrated into a thriving sports and entertainment district. The arena’s curvilinear form and organic geometry include an elegant, metallic facade with transparencies that strategically connect fans to the surroundings. This transparency creates an inviting atmosphere and provides glimpses of the action taking place inside. A large exterior projection screen on the underside of the arena’s roof will show footage of the event underway to fans in the public plaza. To engage fans beyond the arena’s walls, the design blends the indoors and outdoors. An open-air concourse celebrates the Mediterranean climate and optimizes year-round revenue generation opportunities through concession areas and amenities that the public can enjoy 365 days a year. Outdoor patios, public plazas and green spaces across the site, which will be vehicle-free, create informal gathering places. HOK and TAC Arquitectes designed the seating bowl to emulate a theater environment with an asymmetrical design—the first of its kind for a basketball arena—that provides more capacity on one side. Using state-of-the-art, customized digital tools, the designers calibrated the venue and bowl geometries to achieve optimal results for viewing quality, shape and dimensions of the event spaces. The compact building span reduces structural costs and improves operational efficiencies. In addition, the tighter, steeper and more intimate bowl provides exceptional sightlines, creates a “wall of people” and captures the noise to create an intense spectator environment and intimidating venue for visiting teams. A flexible, retractable seating configuration adapts for various uses and maintains the current Palau’s reputation as an energetic, intimidating arena that provides a unique experience for Euroleague fans. The design prioritizes sustainability, reducing the energy and water demands by passive means while minimizing waste and incorporating local plants and materials. Water-saving fixtures, daylighting designed in response to the radiation map, low-emission materials, building automation and paperless ticketing enhance operational efficiencies. “We wanted to develop a design which was very much about the club, for the club and for the local context,” said John Rhodes, a director of HOK’s Sports + Recreation + Entertainment group, in Sports Business Daily. Visit FC Barcelona’s official New Palau Blaugrana website. Watch HOK’s John Rhodes and TAC’s Eduard Gascón talk about their team’s design of a new multipurpose arena for FC Barcelona. 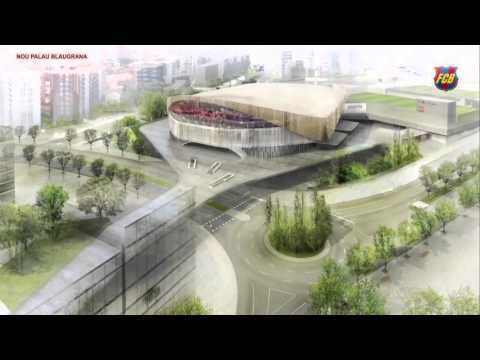 Take a video tour of the HOK-TAC design for FC Barcelona’s New Palau Blaugrana.